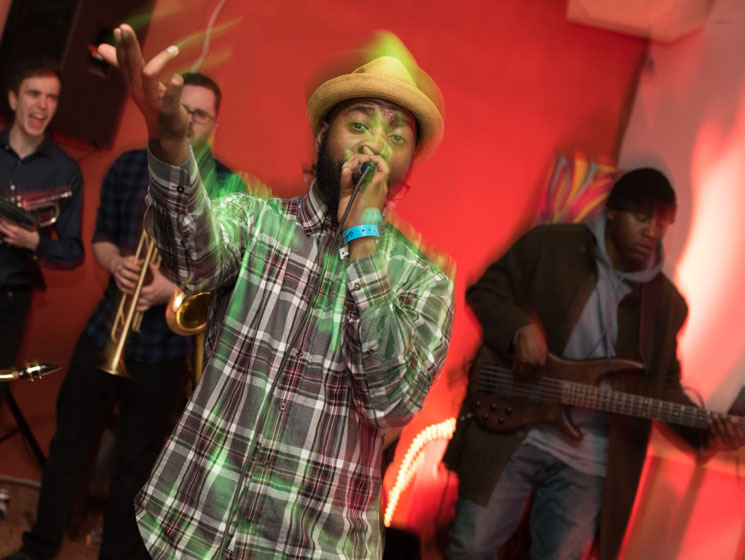 With an extra horn player in tow for the occasion, eight-piece (plus one) hip-hop band Blakdenim wasted no time in riling up Triple 7 with a free-flowing set loaded with originals and genre staples. The four horn players led the group through the hook of Fat Joe and Remy Ma's "All the Way Up" to open the evening, then played through a verse of Kendrick Lamar's "HUMBLE." before a medley of Curtis Mayfield's "Move On Up," and the Mayfield-sampling "Touch the Sky" by Kanye West. Once they had the audience engaged with those favourites, the band got everyone involved in the call-and-response of originals "WTFU" and "Hold Up Hold On." The band format proved impressive beyond accompaniment alone, with all nine members moving expressively to every bar from Precise Kenny Creole and every high note hit by Crystalena Paquette. Some audience members even got to tap in to the on-stage energy by taking the mic up themselves for a few quick verses.